The Litter Bug: Does some debris come from bins with no lids + a gust of Wind? Greetings! Most people we speak with say they made a commitment to never ever litter. Where does all this litter come from? Well, our good friend “the Wind” may be able to explain. Some items from recycle bins may fly around since they have no lid. To prevent this, you can place your Blue bin on top of your Red bin. You can place heavier items at the top, rather than loose items like paper, or even water bottles. To prevent garbage from becoming flying debris, but that lid on it! Windsor – Curbside Collection of Compost by 2025! That’s right! In this blog entry, we’ll discuss Windsor’s initiative towards curbside collection, and in an upcoming entry, we’ll talk the how-to of composting at home. By 2025, Windsorites will have a “Green Bin” to separate organics such as food scraps, sawdust, coffee grounds, etc. from their recyclables, and trash. This’ll be collected regularly, and according to the Essex-Windsor Solid Waste Authority (EWSWA), about 30% of what’s currently sent to the landfill is food waste. First off – What does our municipality say? EWSWA said the facility will wait until 2019 “to prepare for these changes…in case there is a change in provincial government, which could result in changes to the framework,” (CBC News -May 03, 2018). In 2014, the City looked into this, but “decided the [yearly] $1.5-million price tag was too expensive.” So, as of now, Composting is a-go! This new department will contain these items for proper treatment (and to contain the smell)! The matter will then be converted into soil conditioner and animal feed. Imagine how many jobs will be created. 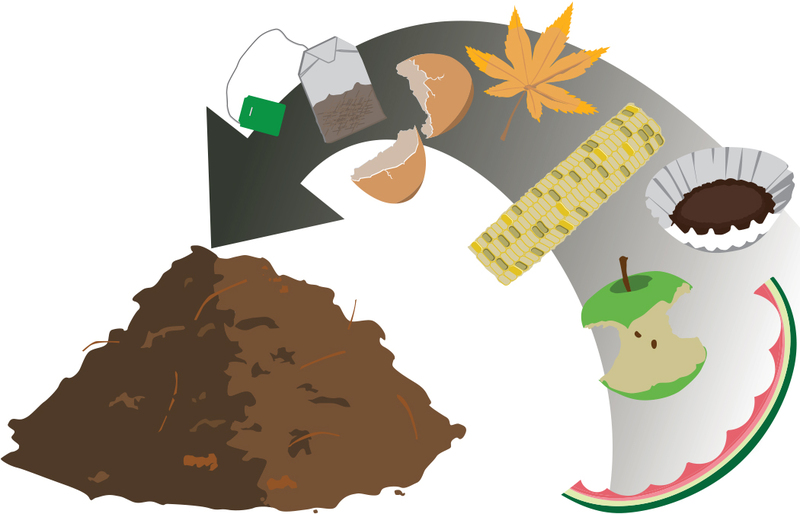 So, how does compost form best? Green items include: grass clippings, fruits & vegetables, plants & weeds, coffee grounds, eggshells, and manure of animals. Brown items include: woody material, straw, sawdust, cardboard (shredded), old leaves and flowers, pine needles, corn stalks, and dryer lint. * Note: Animal bones, and meat, should not be included so that animals are not attracted. How much garbage are we going to avoid producing? What does compost do when it is added to gardens/ farms? Ontario Compost Quality Standards mentions it returns nutrients to the soil, improves soil structure, helps soil retain moisture, can suppress some plant diseases, and contributes to healthy soil ecosystems…Also, a big thanks goes to billions of bugs as well! Stay tuned with how to compost at home while you wait for 2025’s collection. What goes where?! If you can’t donate these items, this is how you dispose of them! Costco Food Court Will Recycle Again! Costco [of Windsor] will recycle once again in their food court after having considered Waste Free In Windsor‘s suggestion. Management staff gathered Feb. 26, and confirmed they will place a Blue Box in the food court. In the future, they may consider placing a red bin as well. The food court did have recycling in place before; however, it had been removed since staff found that too much trash was being improperly disposed of in the Red and Blue boxes. Management is content with having Blue Box / container recycling again in the food court. Furthermore, Costco of Windsor also recycles cardboard, prescription bottles, “Shrink” wrap (plastic wrapping around shipment crates), and provides recycle bins for staff and clients at front cashier tills. Here are some “next steps” to consider – 1) Are Costco clients now disposing too many paper products in this Blue Box? 2) How will Essex-Windsor Solid Waste Authority (EWSWA) consider businesses that have an excess amount of paper products in loads that are meant for Blue Box recycling? Hello supporters from Essex & Windsor, Saskatchewan, Australia and India! We had a social media challenge a while back and we were going to pick one winner. With consideration to the amount of submissions we received, Rosanna and I have decided that we will feature all submissions. Thank you to Natalie for participating. Natalie bought a reusable, metal straw from ShopEco because she knows that straws cannot be recycled here in Windsor/Essex. Thank you to Krithika for show casing her Mom’s daily hard work to compost and reduce waste in her home in Chennai, India, despite the governments neglect of waste management. Thank you to Krithika’s mom, Subathra for sharing the information about your use of these pots made of clay, to make compost in order to improve soil quality for your plants! Angela, thank you for sharing this picture of you and your fine clothes line. Angela gives the Earth a break by letting her towel dry naturally instead of making the Earth work hard by producing energy to make her dryer work. Thank you, Kimberley for reminding everyone to recycle, and recycling very carefully when you were here in Windsor. Hopefully she kept it up when you were back in Australia ;). Last but not least, thank you Natasha for using a reusable water bottle instead of using a single use water bottle. We will be hosting our first Community Clean Up at McKee Park on Saturday, October 14th. The clean up will be from 12-4pm. We will start by going around the surrounding area, and around 3 we will sort all of the litter so we can properly recycle everything that we pick up. We are asking that all participants bring at least one canned good to be donated to the Windsor Youth Centre. We will also have a donation jar for anyone who wants to donate to us, Waste Free in Windsor. August 29th, we began Waste Free in Windsor’s (WFIW) Tim Hortons Eco Initiative. Our Plan: Give Tim Hortons restaurant’s the opportunity and knowledge to implement simple practices to be more environmentally conscious. Our Action: First, we visited a Tim Hortons restaurant who were already eco experts. Then we visited four more Tim Hortons where we gave suggestions, and received a great amount of support from the employees. We know how to recycle ourselves, but we thought it would be a good idea to see specifically how a Tim Hortons store can be run with recycling as a priority. The Lasalle Tim Hortons on Malden has been recognized by Essex-Windsor Solid Waste Authority (EWSWA) for their recycling efforts. The store is owned by Sue and Jon Schroeder, and managed by Suzie Dufour. We took a picture on our way in to see their EWSWA sticker. Dufour, explained that the store decided to bring change Sue Schroeder she came across a newspaper article in the Windsor Star about EWSWA. Schroeder brought this to the attention of Dufour who helped the rest of the store begin to follow EWSWA’s guidelines. Unlike some of the other Tim Hortons we had visited, the indoor receptacles at the Malden Timmies has separate slots for plastics, paper, and waste. The receptacles are originally made to have two waste containers and only one spot for recyclables, but that did not stop Suzie for making room for paper recycling!! It is important that the Schroeder’s Tim Hortons sorts their recycles because EWSWA cannot do it for us–businesses or residences. When the recycle truck has two separate spots in it–one for blue bin materials and one for red bin materials. It is OUR responsibility to sort the recyclables. Once the recycles arrive at the plant, the red bin materials are dropped off at one building and the blue bin materials are dropped off at another. This means that materials brought to the wrong building are thrown in the garbage, and our efforts to recycle are gone to waste. Next, the slots for recycling do not have plastic bags inside them which means customers can place their items loosely inside of the bin. All of these bins are emptied in their outdoor container for pick-up. This is exactly what Windsor-Essex Solid Waste Authority likes to see when collecting residential and business recycles–LOOSE ITEMS! If you don’t know, EWSWA’s plant cannot accommodate for recyclables coming in, inside of plastic bags. When the plant receives plastic bags on the line it often gets stuck inside of the machine. Also the line workers must rip open the bag and sort through the bags. When there are too many plastic bags at once, many of the full plastic bags end up in the garbage–AKA recycles end up in the garbage. This is for residential recycling too! Tim Horton’s head office requires all recycle and waste bins to have bags; however, Dufour has explained that because this location is environmentally conscious, the rule does not apply to them. To get head office on board, she simply explained she was respecting the needs of the city’s recycling company. We are very happy and thankful that Suzie Dufour welcomed us into the Tim Hortons. She gave us all the information we needed. Thanks Suzie. She also told us that the Schroeder’s also own the Tim Hortons on Dougall and they do the exact same thing! Next we stopped by four other Tim Hortons to see how they compared to the Schroeder’s stores. Two locations, that will remain unnamed, did not have much to say. One store was too busy to talk, and asked that we come back another day. The other store told us to come back with a written copy of all the information to give to the store owner. This location seems to have their recycling bins set up fairly well. The bins are set up so ‘blue bin’ items and ‘red bin items’ can be sorted, if customers decide to check the signage. They use plastic bags in their recycle bins, and when we suggested to get rid of them the manager Stephanie, told us she would be happy to talk to the store owners. She was happy to have us follow up with her in a few weeks. This location reduces waste by having their mop heads professionally washed three times weekly, rather than throwing them in the garbage. We asked the location at Ottawa & Kildare to rearrange the signage on indoor receptacles to provide a slot for paper items, as they only have disposal for waste, and plastics. We suggested getting rid of the plastic bags–their decision is TBA. They had no problem when we asked to follow up with them. This location reduces waste by composting. They save their coffee grinds for customers to use in their gardens! We had a great day and many good conversations. This was only day one of our first project as a Waste Free in Windsor team. We will continue with this project so stay tuned for some more updates.